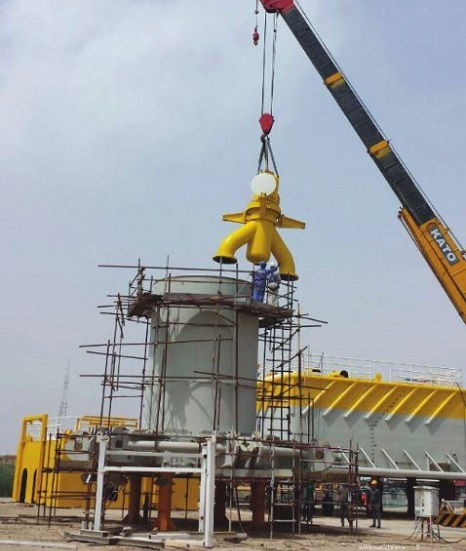 Namdaran Petrogas Industries Co. (NPI) has been successful in designing and manufacturing of SPM Swivel strategic equipment, utilizing high technical, engineering knowledge locally fabricated by our experts in Iran for first ime. It is worth noting that a few of the world›s advanced countries have the technology of designing and manufacturing such equipment. With high performance of the delivered swivel by our company, Iran is among the pioneers in this field. Single point mooring (SPM) is a floating buoy anchored offshore to allow handling of liquid cargo such as petroleum products for tanker ships. SPM is mainly used in areas where a dedicated facility for loading or unloading liquid cargo is not available. Located at a distance of several kilometers from the shore-facility and connected using sub-sea and sub-oil pipelines, these single point mooring (SPM) facilities can even handle vessels of massive capacity such as VLCC.